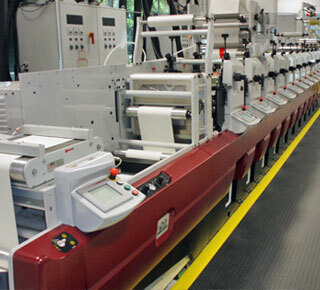 Flexography has become the standard means of printing large runs of full-color roll labels or tags. In flexographic printing, flexible polymer plates with raised image areas are wrapped around metal cylinders. Ink is transferred from a pan roll to an analox, or “metering”, roll, and then onto the plate. This configuration is repeated for each desired color. A roll of media is spooled through the press where each color is printed in sequence and in register. Flexo labels can foiled or embossed and even rotary screen printed in-line. At the end of the press, labels are die-cut and rewound.